We provide electrical, lighting and wiring services to commercial, industrial and residential clients. We provide high-quality fencing for both your home and business. Serving all of Kansas and Oklahoma areas. We are a Wichita, KS based company offering a variety of commercial and residential services year around to make sure your lawn and landscaping always look their best! 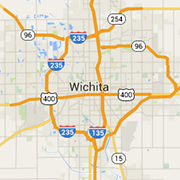 A fully licensed sprinkler system service company located in Wichita, KS. Using attention to detail and a customer first mentality in pest protection, janitorial services, and lawn care in order to give back to Wichita.